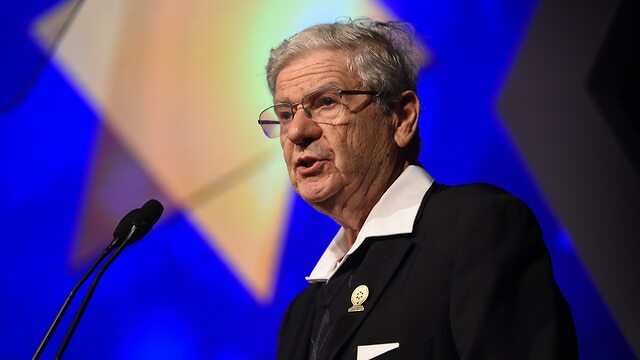 Supreme Court Presidents Emeriti Aharon Barak is concerned for the future of the Israeli democracy, which he believes is under threat, according to a speech he gave Tuesday at a conference marking the 70th anniversary of the State Attorney's Office. "Our approach to this issue is that it cannot happen here and it is wrong. If it happened in Germany during the times of Bach, Goethe and Beethoven, it could happen anywhere," he stressed. Barak elaborated on his frustrations, suggesting democracy is under attack all throughout the world. “Democracy in the world today is under attack mainly because of problems with immigration and terrorism. If we do not defend democracy, it will not protect us," he exclaimed. In his speech, Barak addressed Justice Minister Ayelet Shaked’s remarks that if the Supreme Court repeals a basic law, it would equivalent to an earthquake. "According to the speeches we hear, it seems that if the Supreme Court overturns a law passed by the Knesset—it would be the end of democracy,” he said without explicitly mentioning Shaked by name. “It is true that democracy is the rule of representatives of the people … But we must not forget that a regime that rejects the separation of powers, the rule of law, basic values ​​and human rights, is not a democratic regime," Barak vented. Barak attacked Shaked's bill proposal to change the procedure in which the legal advisers of government ministries are appointed, accusing the government of wanting to minimize the influence of gatekeepers. "When the idea is to turn the attorney general into a trust servant, with a minister in charge having a decisive influence on the choice, it is a grave violation,” the former Supreme Court president warned. A group of female activists protested in Jerusalem on Friday against the government's inaction to stop the murder of women. 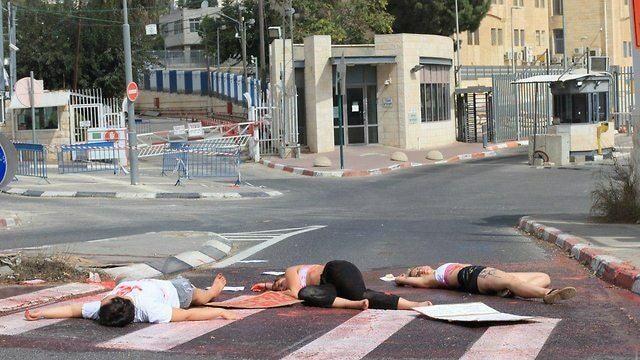 The protesters lied down on the road in 'blood' puddles surrounded by death notices for the women murdered this year and signs that said, among other things, "Gilad Erdan, how do you plan to stop the next murder?" They chanted slogans such as "their blood is on your hands" and "there's no honor in killing." The protesters, who were blocking the entrance to the Public Security Ministry, were evacuated by the police shortly afterwards. "We're protesting not for the first time in general and not even for the first time this year over the inaction of the relevant position-holders to prevent the next gender-oriented murder," explained Anna Klieman, one of the organizers of the protest. "We've had a bloody week, two women were murdered and another one is in the hospital in serious condition because of violent men in their lives—partners, husbands, divorcees and exes," she continued. Klieman complained that "Actionable recommendations made by the Knesset’s Committee on the Status of Women and Gender Equality and the Interministerial Committee for the Prevention and Handling of Violence in the Family are collecting dust in the Public Security Ministry's drawers. They were already costed and all that's left to do is allocate the money and implement them." Instead, she continued, "Public Security Minister Gilad Erdan and Police Commissioner Roni Alsheikh are tarrying and more and more lives are lost. We haven't heard a word from them on the matter, while women are murdered one after another. How can that be? Don't you care if women live or die? Don't you care that more than a third of the murderers are known to authorities, which don't lift a finger to prevent these needless deaths? How many more women need to be murdered? How many more puddles of blood and bodies do you need to see for someone to decide to invest money in preventing our needless deaths?" Another organizer, Shoshan Weber, said that "every year an average of 20 women are murdered. We reached that number already this year, and we're only in October." "This is gender-based terrorism to all intents and purposes," Weber stressed. "The media calls it 'honor killing' or a 'crime of passion' but there's no passion or honor in this. This is the violence of men against women, in a manner that repeats itself and can be prevented." "The state institutions abandon women—more than half of this country's citizens—again and again: starting with the police that ignores complaints about violent partners or husbands, threats and intimidation; through the prosecution that closes cases en masse and puts violent men back on the streets, something that limits women in all aspects of life; and finally courts that settle for ridiculous restraining orders that cannot be enforced. All of those bear the responsibility for each and every murder. Do something, the blood of all of the women murdered this year and every year is on your hands," she added. Thursday saw demonstrations protesting violence against women in 20 places across the country. Demonstrators observed a minute of silence in memory of the 20 women murdered since the beginning of 2018. "This is violent and ongoing male terrorism that should be treated as a national plague that must be eradicated," the organizers said. Some 500 people, including artists and politicians, attended the main protest at Dizengoff Square in Tel Aviv. "Over 160 were murdered over the past decade," said actress Yael Abecassis in tears. "We were unable to protect them." A police officer pushed a protester from the "Disabled Panthers" group to the ground during a demonstration against the low disability benefits rate on Monday, resulting in the protester's hospitalization. The demonstration, during which protesters blocked the main car entrance gate to the Knesset, did not receive police authorization. After blocking the entrance, the protesters tried to break through the gate. During the confrontation that ensued, a police officer shoved one of the protesters. After the demonstration at the Knesset, which began its winter session on Monday, the protesters went on to block a major junction in Jerusalem, causing traffic disruptions in the area. They later blocked the light rail tracks in the capital. “As you can see in the video, the suspect punched a police officer in his upper body, and grabbed the arm of another officer, forcing them to push him back,” the police statement said. A Ynet examination of the video found it was not edited, refuting the police’s statement. On Tuesday, the protesters declared their intention to visit the grave of fellow disabled protester Yaakov Volk, 60, who set himself on fire in Jerusalem last week and passed away on Wednesday. The activists said Volk had ended his life due to financial issues. They accused the police and the hospital of not disclosing the funeral details to prevent them from attending. But Volk’s relatives claim his death had nothing to do with the protests. This year, for the first time in 16 years, disability benefits were raised to NIS 3,270 a month and is expected to grow further at a later stage to NIS 3,700. However, this sum is still significantly lower than what the protesters are demanding, which is benefits fixed to the minimum wage, that currently stands on NIS 5,300. “If Mr. Netanyahu was concerned about the situation of Palestinian Christians, particularly in the Bethlehem area, he would return the 22,000 dunams of Bethlehem land illegally annexed to Israel for expansion of colonial settlements. 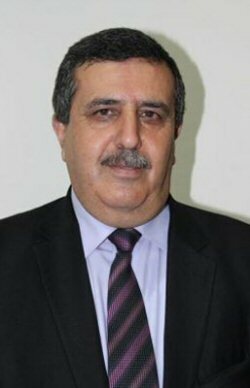 He would dismantle the annexation wall that divides Bethlehem from Jerusalem, for the first time in 2000 years of Christianity, and would stop imposing restrictions to Palestinian movement, including the thousand of Palestinian Christians living in exile and whose return is impossible due to the Israeli control over the Palestinian population registry,” said the mayor in a statement issued by the Bethlehem municipality. Speaking in Jerusalem before 140 foreign journalists, Netanyahu slams Palestinian President for 'rewarding terrorist'; stresses Israel is a strong democracy that also defends the rights of Muslims and Christians and praises President Trump for US Embassy move to Jerusalem. 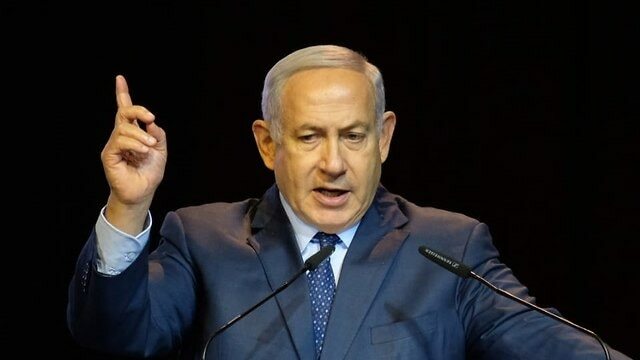 Speaking in Jerusalem before 140 foreign journalists from 40 different countries, Prime Minister Benjamin Netanyahu strongly criticized Palestinian President Mahmoud Abbas, blaming him for rewarding terrorists. "Look at our neighbors. Look at what President Abbas is doing. I mean, he's rewarding terrorists. Pay for slay. The more they kill, the more they get paid. He has on his law books a rule, a law that says that if you sell land to Jews – you'll be executed. Some peace and some coexistence," the premier vented. In reference to the transfer of the US embassy to Jerusalem, Netanyahu said, "The American Embassy is close by, is actually within walking distance and it's a result of a bold and historic decision by President Trump to recognize Jerusalem as Israel's capital and move the US embassy here. I think he deserves tremendous applause for a tremendous act. President trump corrected an historic wrong. I mean the idea that we are not attached to Jerusalem is an unbelievable fiasco that you see at the UN institutions, resolutions, at UNESCO. "This attempt to falsify history is vis-à-vis Jerusalem and vis-à-vis our connection to this land is a terrific injustice to the tribulation of the Jewish people that have made a journey that is unsurpassed by any other people. "Israel is the only country in the Middle East where the Christian community thrives and grows. Without Israel radical Islam would overrun the Middle East easily, Israel not only protect itself nut also protects the neighborhood," he went on to say. Addressing the Iranian threat, Netanyahu said, "Iran wants to base itself right next to Israel in order to destroy Israel. They say so openly. We will not let them do so. We back up these words with actions, including now in these days, as we speak. Nothing has changed. We'll continue to do what we need to do to protect ourselves and defend ourselves against those who would destroy us," he asserted. "Several weeks ago the Iranians attempted to plan a terror attack against the regime in Paris," he vented. "Iran is organizing terror cells around the world. Iran view us as the small devil, Europe is the medium devil, and the US is the big devil. "Iran has expanded its empire through countries as Syria and Yemen. Don't give Iran the tools to destroy us," Netanyahu exclaimed. Calling the journalists ambassadors of truth, the prime minister asked them to tell Israel's history, its present, about who wants and who does not want peace, stressing the fact Israel is a strong democracy that defends the rights of Muslims and Christians. "People have to say the truth. You are ambassadors of truth. You're not merely the greatest ambassadors that Israel has around the world. You're champions of truth. And if there's one thing that I can ask you to do is to tell the truth. Tell the truth about our history, tell the truth about our present, tell the truth about who wants peace and who doesn’t want peace," he elaborated. "That is also applicable to what happened in the Palestinian Authority areas. You know the town of Bethlehem? Yes. You have a connection to it. We all do. And among other things, we have a connection to King David, the history of Ruth as you know, but also the story of Jesus. "Now, Bethlehem had when we handed it over to the Palestinian Authority a Christian population of roughly 80%. Now it's about 20%. And that change happened because in the Palestinian Authority areas, as well as throughout the Middle East, Christians are being constricted, they're being pressured, also they're being persecuted," Netanyahu lamented. When asked about American Student Lara Alqasem, who has been barred from entering the country because of alleged involvement in the BDS movement, the Israeli leader said that every country has the right to decide who can enter it. "Every country and every democracy and many democracies have special arrangements where they decide who to let in and who not to let it. If you come in and you are virulently against America and you try to come to the United States, there's a good change you won’t be let in if people know that in advance. That's also true of many of the European democracies. It's true of the democracy called Israel. "I trust that Minister Erdan has examined that and looked into it. It's under the decision now of the Israeli Supreme Court so I'm not going to get into that. And they'll decide whether they handle it or not. If they handle it, we'll see how it develops. If they don’t handle it, she'll be deported," he stated. After Netanyahu concluded his speech, US Ambassador to Israel David Friedman took the stage. "Ten months ago the US administration acknowledges Jerusalem as Israel's official capital. Every day in which I go to work in Jerusalem is a special experience for me, and I'm not taking it for granted. "Not a day goes by without me thanking for the privilege given to me to serve as the US ambassador in this holy city," Friedman said.